The three largest ship models in Glasgow Museums’ collection – the Queen Mary, the Queen Elizabeth and the QE2 – are preparing to make their final voyage. In the next few weeks, they’ll make the last leg of their epic journey from the Clyde Room at the Museum of Transport to the new Riverside Museum. Like all of the ship models in the collection, these three ships are incredibly fragile. Unlike the others, however, they are huge! These are hefty models that weigh up to 258kgs each, and took a team of six people to carefully move them out from their display case in the Clyde Room and onto maneuverable skates. Specialist contractors from Constantine carefully lifted them into custom-built wooden crates using fabric straps. The models were then covered in protective sheeting, the crates built up around them, and the interiors filled with packing to prevent the models moving. Soon they’ll be forklifted down into the main hall then loaded onto a lorry and taken to the Riverside Museum. There’s been an awful lot of activity in the Clyde Room recently, highlighted in Iona’s slideshow and Picture of the Week. Among all the packing and moving, the last of the ship models are being conserved. All the ship models for the “big” displays have been conserved; what’s left are the largest models. The three Queens, the biggest ship models in our collection, have been left until last to conserve. The logistics involved in moving them and then storing them once conserved meant it was easier to leave them and work on the smaller models first. It took eight people to move Queen Mary out of her case and on to a work table! I’ve spent the past four days swabbing the decks and checking Queen Mary’s condition. The key to working on such a large ship model is not to be put off by the size: she’s made of the same materials as many of the other ship models and due to her size it’s sometimes easier to access areas that are hard to reach on other, smaller models. That said, when you’re sat at the bow with a cotton bud it does seem an awful long way to the stern! Queen Elizabeth is next on the list followed by Queen Elizabeth II. Once conserved, they’ll be installed at Riverside along with many of the other ship models from Glasgow Museums’ collection. As outlined in last week’s Picture of the Week, we’ve had a new team come aboard the Riverside Museum Project to assist us with the removal of our middleweight objects from the Museum of Transport at Kelvin Hall. Constantine, who are specialist museum handlers and familiar faces around our various museums, have been working on emptying the ship models cases in the Clyde Room. 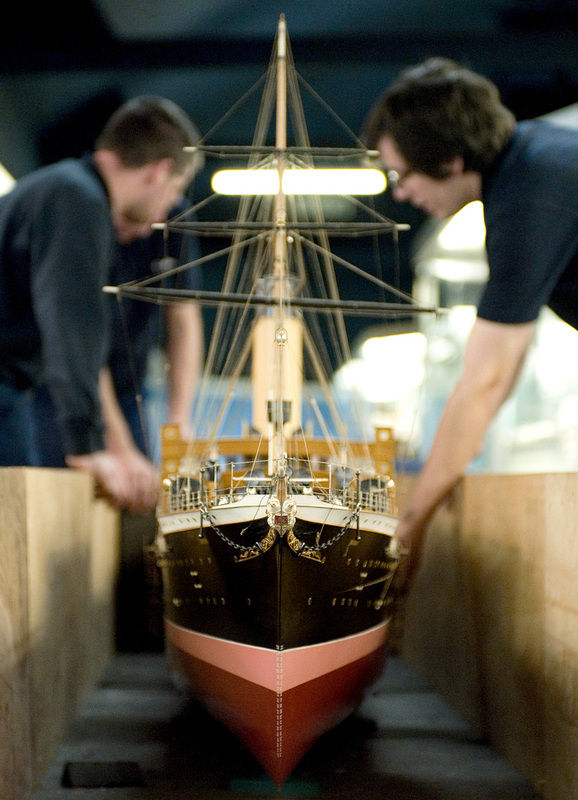 They will be transporting these delicate ship models as well as bicycles, motorbikes and cars to storage and, in the next few weeks, to the Riverside Museum at Pointhouse. The slideshow above shows the steps they take to move our often very large and heavy ship models. Purpose-built crates are forklifted upstairs towards the Clyde Room, where the models are carefully removed one by one from the cases that have been their home since their arrival in the building in the late 1980s. Once set down in the crates, plastezote blocks are used to secure them in place for their ride to their final destination. Soon enough we’ll have a Clyde Room full of empty cases as the objects in the building continue to move out and we get closer to the Riverside Museum opening. This week at the Museum of Transport we’ve had more contractors starting work with us, this time on the decant of Glasgow Museums’ ship model collection. The emptying of the building continues with the decant work now concentrated in the Clyde Room. The picture of the week shows staff from Constantine packing ship models into crates which will next week move to storage at Glasgow Museums Resource Centre. Once these have moved, they’ll move the remaining ship models to Riverside where they’ll be readied for display. More picture on how these models are decanted will be revealed next week. Keep watching! This week I took some shots of mount-maker Simon making a beam which will form part of the structure for ship model displays in the Riverside Museum. 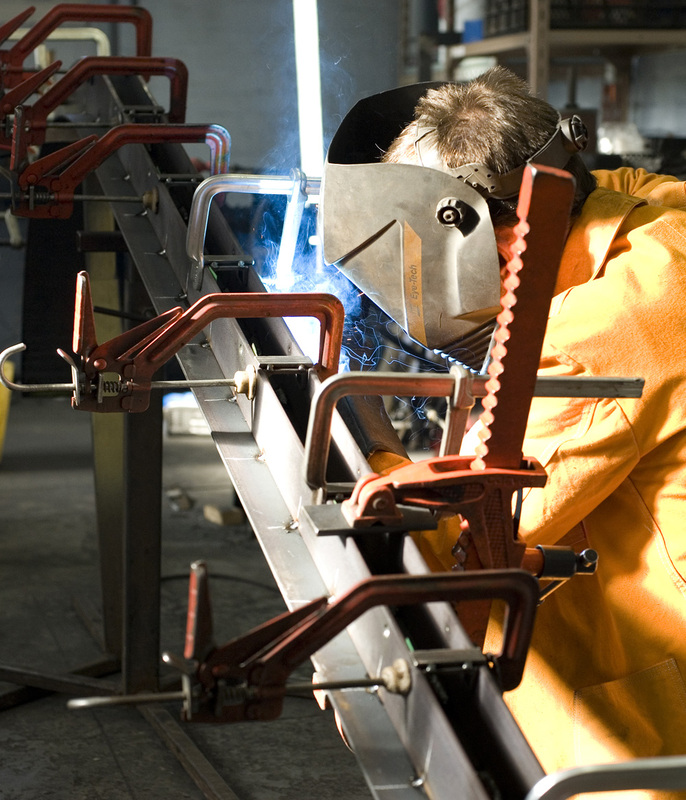 Here you see him in his full protective welding gear. The metal workshop in Glasgow’s Museum of Transport has several windows through which shafts of light fall in sections. The position Simon was in meant that for this shot he was lit up by both the sunlight and the flare of his welding torch. This mix of shadow, daylight and flare helps create an interesting image where the focus of the viewer is drawn to the brighter area. Thankfully, a long lens kept me safe from any stray sparks! The packing of the objects at Museum of Transport in Glasgow is progressing at a steady pace – and on schedule. Here’s the latest news from the Riverside Museum Project’s Decant team as they continue their work on the mezzanine floor of the museum.